In the beginning there is water and the Spirit. As we read the first verses of Genesis, we are reminded that, before God speaks the first command of Creation, the wind of God moved over the waters of chaotic inexistence. In reality, water is just as much a product of God’s work as everything else. Our theology teaches us that, prior to the act of Creation, nothing (not even water) had come into being. But then why is water even mentioned? Perhaps, for the people who first told the story of Creation, it was the best metaphor they could imagine for what came before “the beginning.” Water is a shapeless, formless substance. It is not inherently good or bad. It has the ability to preserve and to destroy. In the realm of all things created, water was perhaps the best image they could come up with for non-Creation. Of course, we find water playing a prevalent role in our second story of beginnings today, as Jesus comes to be baptized. By the time this story is told, water carries with it the history of the interaction between the Jewish people and their God. When God sought to destroy the evil that had infested his Good Creation, the Lord used the waters of the Great Flood to purge the earth of evil. When God sought to lead the people of Israel out of Egypt, he parted the waters so that they might pass, then brought them back together, so that their pursuers were cut off from God’s people. When the people complained of thirst in the wilderness, God sustained them by bringing forth water from a stone. And when God led the people out of the desert, the waters of the Jordan parted so that the people might cross into the land which the Lord God had promised to them. The people flocking to see John in the wilderness carry all of these stories with them as they come to the water. And yet, the waters of baptism had, by no means, been established as a place to interact with the Almighty. Under Jewish law, those wishing to petition the Lord would have traditionally done so by going to the Temple in Jerusalem, so that they might make an offering to God. But in that day, the people’s offerings had become tainted by the corruption of religious leaders, who abused their authority to pursue their own interests ahead of the relationship between God and the covenant people. And so, those people turned their backs on Jerusalem and returned to the wilderness, in the hope that they might here encounter God once again. This act is a literal act of repentance, turning away from sin and toward God. The people confess their own sinfulness and are baptized as a symbolic mark that God has washed away all their iniquities. And yet, in all their zeal for renewal, the people have no idea just how close they are to God. 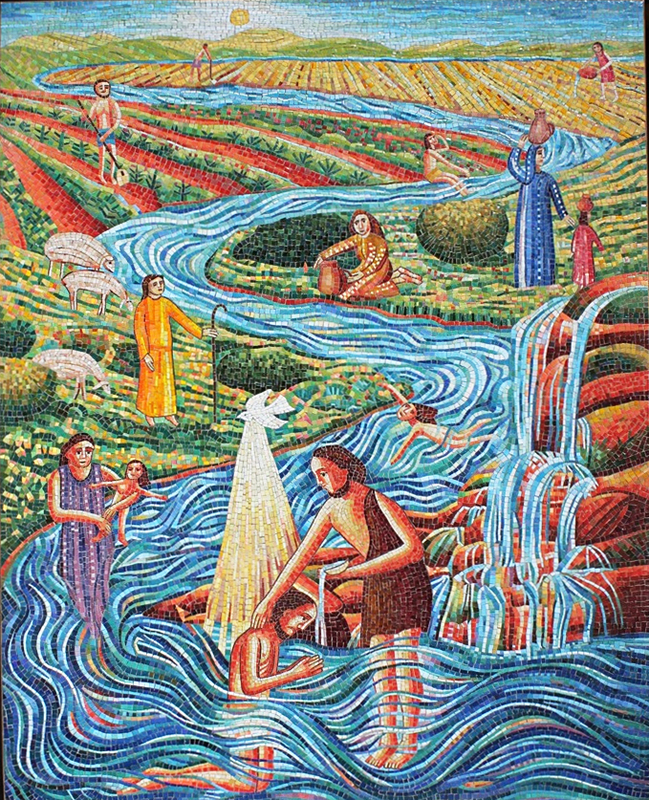 A Mosaic by Artist John August Swanson, depicting John baptizing Jesus at the Jordan. Even John, who has dedicated his ministry to preparing the way of the Lord, is caught off guard when Jesus comes. John knows this man—this cousin of his. While there are many who need to come and seek forgiveness, Jesus is not among them. So, what is he doing here? I heard a story of a pastor who had devoted his career to preaching God’s mercy and love and calling people to repent of their sins and to receive God’s forgiveness. But sadly, he silently struggled with one particular sin of his own, to the point that he began to doubt the truth of the Good News which he proclaimed. In time, his skepticism led him to conclude that there was simply no way that God could ever redeem him. His sin, known only to him, was simply too great for God to forgive. Though she didn’t understand the request, the old woman agreed. The following week, she met with her pastor again. “I did,” answered the little old woman. “Huph!” the pastor laughed, satisfied that he had disproved the woman’s claim. So often, we struggle to forget the things that God has already chosen not to remember. We hold other’s sins against them and we even hold our own sins against ourselves. But the Lord God chooses not to remember those things, as though they had been washed away with the flowing waters of the river. In fact this is exactly what Jesus does in coming to the River Jordan. In that moment, our Lord chooses love for God’s fallen Creations over the eternal separation that would otherwise result from our sin. In as much as Jesus chooses love for us by giving his life on the cross, he also chooses love when he allows his untarnished being to be immersed in the spiritually polluted waters of the Jordan. And what we discover is that Jesus not only remains pure, but his righteousness washes over all those who come after him. In the generations of followers to come, baptism would not only mark a turn from sin. It would also signify one’s acceptance by God into the covenant of grace. The members of this community would receive the same Spirit that had descended upon Jesus. And just like our Lord, each of us would have the assurance that we too have been claimed as God’s beloved children, with whom God is well pleased. Today, as we celebrate the baptism of our Lord and as we remember our own baptism through which our sins have been washed away, we should mark this as not just a moment of commemoration, but one for dedication. As baptism marks the occasion for the start of Jesus’ ministry with God’s beloved Creation, may baptism also serve as our own call to go and minister to the world. Let us share the Good News of baptism like John before us. May we invite our Brothers and Sisters to receive God’s grace and may we extend to them our grace. Having sought forgiveness for our sins, may we not hold our iniquities against ourselves. And having been purified through the waters which Christ shares with us, may we know that our sins have been washed away, and we have been united with God and one another through the power of the Holy Spirit. This sermon was delivered at Bowling Green Presbyterian Church on Sunday, January 11, 2015 (The Baptism of the Lord). This entry was posted in Sermons and tagged Baptism, Forgiveness, Repentance. Bookmark the permalink.